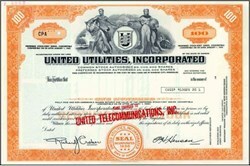 Beautifully engraved Specimen certificate from the United Utilities, Incorporated. This historic document was printed by the Security-Columbian Banknote Company and has an ornate border around it with a vignette of an allegorical man and woman flanking the company logo. This item has the printed signatures of the company's officers ( Paul H. Henson as President). Much of the credit for the basic soundness of UT&E must go to C.L. Brown. Over 30 years, he had built a reputation as a competent telephone and utility manager. Later, in 1964, when Paul H. Henson � a 1995 KBHF Contemporary Honors Award recipient � became president of United Utilities, Inc., he almost immediately reorganized the company in accordance with C.L. Brown�s belief that centralizing some of the company�s functions would result in greater efficiency, cost reductions, and growth.